(L to R) Armed Forces Veterans turned Building Trades Apprentices, Rick Garcia, Jr; Devin Laster, and John Connor; joined by Darrell Roberts, Executive Director at the Center for Military Readiness, Assessment, and Veterans Employment (CMRAVE); all at the April 3rd benefit for Helmets to Hardhats. Washington, D.C. (April 3, 2017) – The AFL-CIO Investment Trust Corporation (ITC) teamed up with North America’s Building Trades Unions (NABTU) to host a fundraiser for the national nonprofit that assists veterans transitioning into the construction industry, Helmets to Hardhats. In order to demonstrate the real-life effects of the program, three special honorees were invited to share their stories with those in attendance. 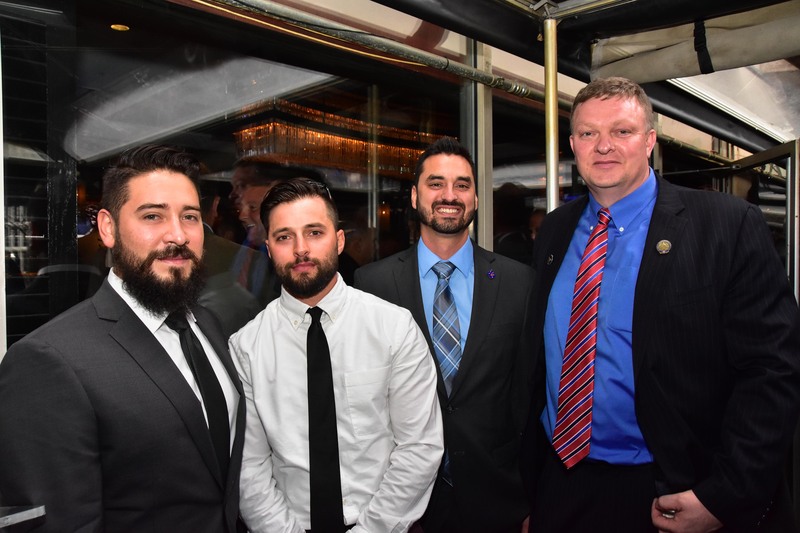 All three honorees are veterans who are now apprentices in their respective trades, in part due to the support they’ve received from the program. The honorees were just a few of the over 20,000 current and former military service members that Helmets to Hardhats has connected with the training and opportunities necessary in order to thrive in the building trades. 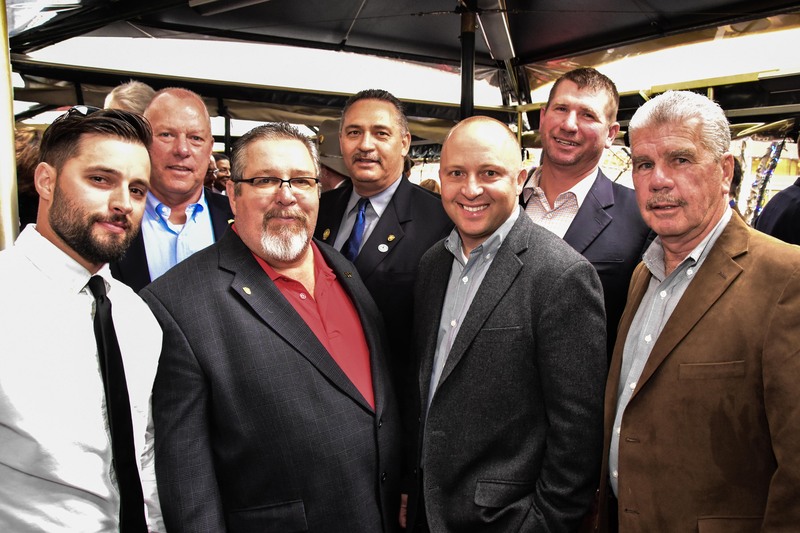 This was the third fundraiser that the ITC has hosted during the NABTU Legislative Conference with the goal of raising upwards of $150,000 for the program. Darrell Roberts, Executive Director at CMRAVE presents Mike Stotz, President of the AFL-CIO Investment Trust Corporation (ITC) with a “Tip of the Spear” Award for the ITC’s work helping the Helmets to Hardhats program. 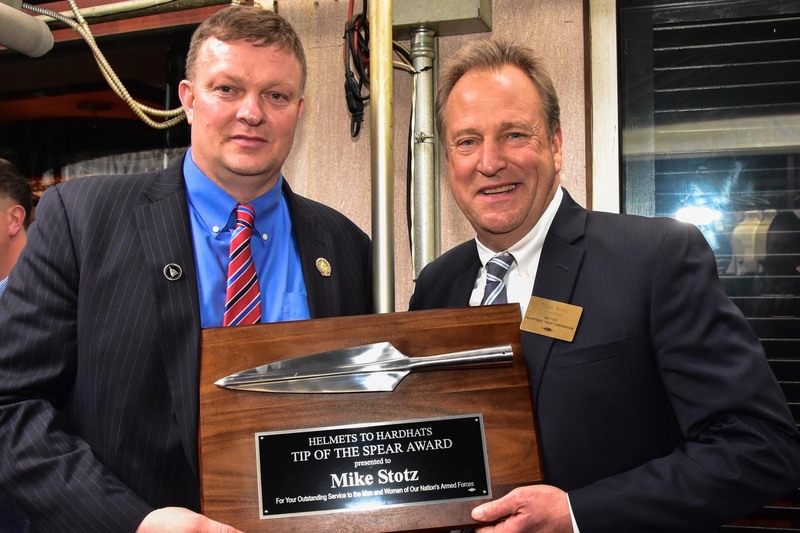 Darrell Roberts, the Executive Director at the Center for Military Recruitment, Assessment, and Veterans Employment (CMRAVE), which administers the Helmets to Hardhats program, presented Stotz with a “Tip of the Spear” award for the ITC’s involvement with helping the program. 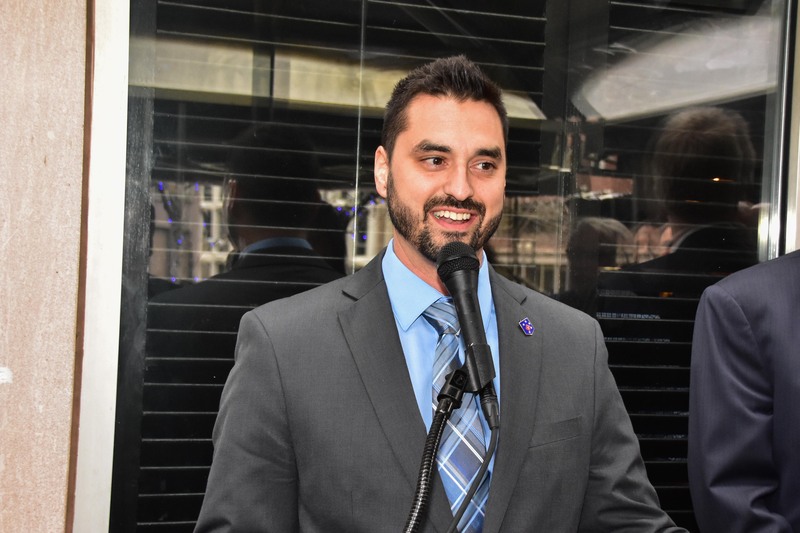 John Connor, a former U.S. Marine Corps infantryman from Hanover Park, Illinois, was among the service members invited to speak at the event. Connor, whose unit was among one of the first into Iraq in March 2003, is now an apprentice with Sheet Metal Workers Local 73 in Illinois. John Connor, former USMC infantryman & current apprentice with Sheet Metal Workers Local 73, speaking at NABTU & ITC’s benefit for Helmets to Hardhats. John Connor on the 43rd floor of Wolf Point West in Chicago, IL. Rick Garcia, Jr., a father of three and an apprentice with United Association Local 250 in California followed up on Connor’s sentiments. Rick Garcia, Jr., former Human Intelligence Collector in the U.S. Army Reserves & current apprentice with UA Local 250, joined by (L to R); Ron Miller, Executive Secretary, Los Angeles/Orange Counties Building and Construction Trades Council; Robbie Hunter, President, State Building and Construction Trades Council of California; Rudy Rodriguez, Political Director, UA Local 250; and Pete Wohlgezogen, President, UA Local 250. “My first month in the trade, one of the pipefitters had passed away due to a car accident. There were maybe 1500 or 2000 people at his funeral, but the majority of those in attendance were all from the trades. 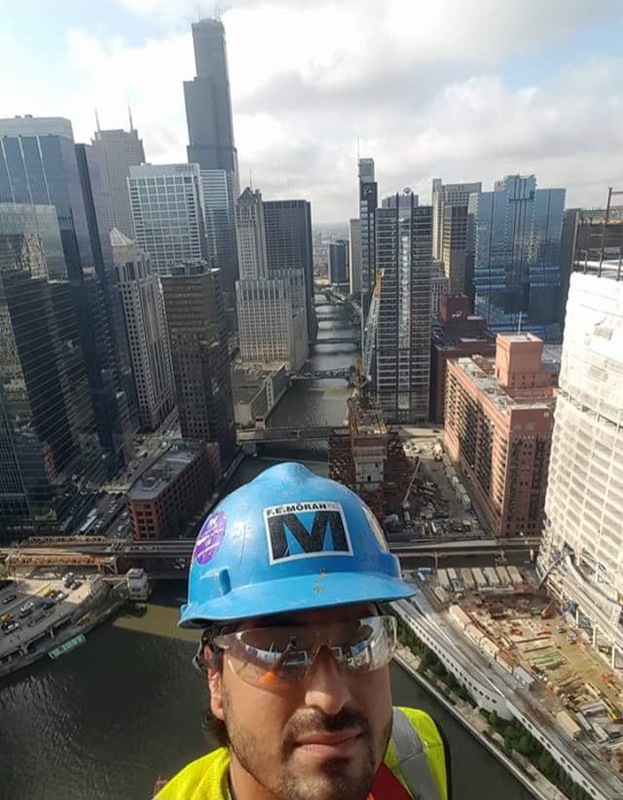 It felt similar to the family atmosphere that you get in the military,” recalled Garcia, who is in the last year of his Steamfitters apprenticeship and is a former Human Intelligence Collector in the U.S. Army Reserves. Devin Laster, an apprentice with Ironworkers Local 396 in St. Louis, spoke about how he heard of the Helmets to Hardhats program while still in in the Army. Laster had deployed three times to Afghanistan with the 1st Battalion, 75th Ranger Regiment, and so he was used to being a part of a tight-knit unit. 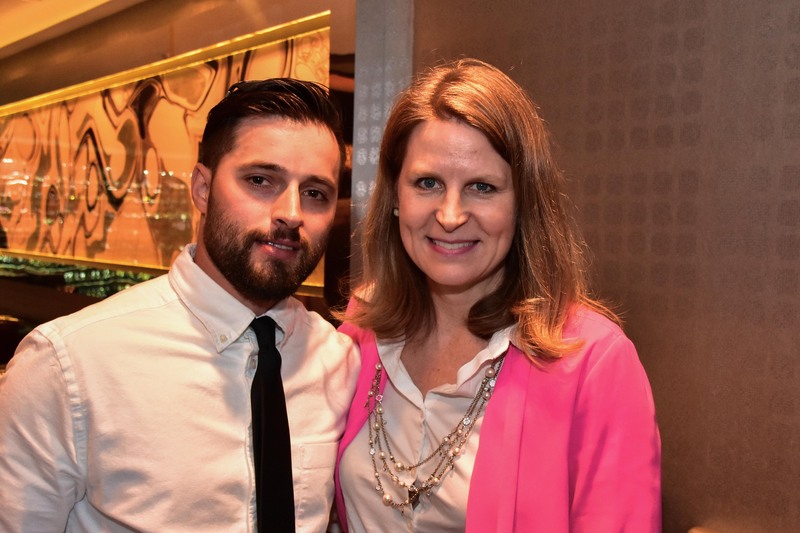 Devin Laster, former U.S. Army Ranger & current apprentice with Ironworkers Local 396; joined by Elizabeth Shuler, Secretary-Treasuer of the AFL-CIO. Devin Laster joined by (L to R); William Brennell, President/Business Agent, Ironworkers Local 396; Mike Butler, Business Agent, Ironworkers Local 396; Bob Hunt., Business Agent, Ironworkers Local 396; Don Robertson, Business Agent, Ironworkers Local 396; Travis Barnes, Vice President, Ironworkers Local 396; and Thomas McNeil, Jr., Business Manager/Financial Secretary-Treasurer, Ironworkers Local 396. “I had some friends who were Ironworkers and they’re like brothers. I knew I wanted to be a part of something that still felt like a family, and now I know that I made the right choice,” Laster said when recalling his thought process prior to leaving the service. 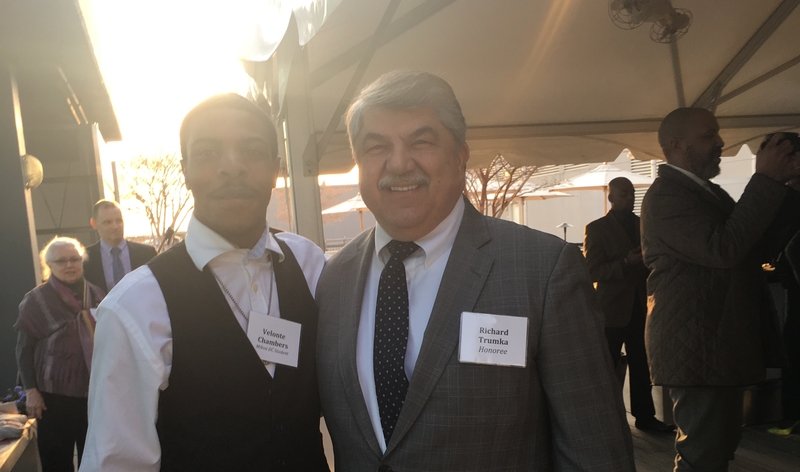 Earlier in the day, Will Attig, the Executive Director of the Union Veterans Council, AFL-CIO, had some uplifting advice for the apprentices honored at the event. 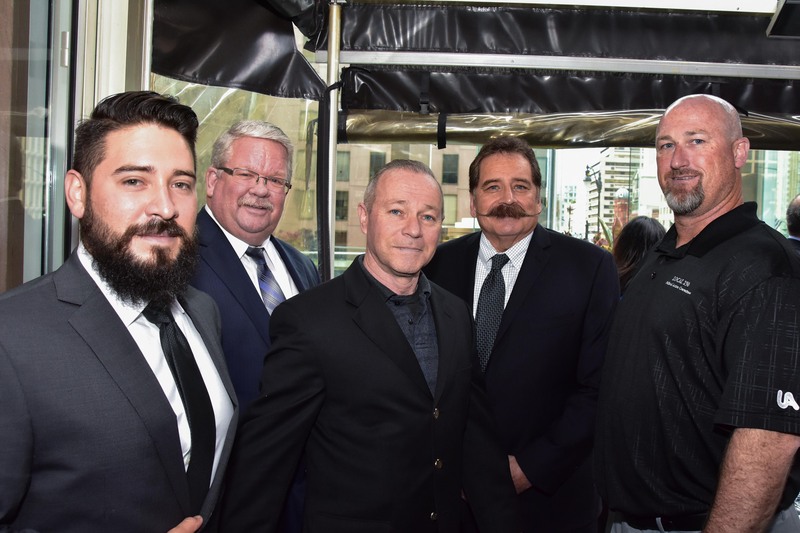 “One of the biggest things that I can guarantee that you’re going to miss when you get out is your squad, your platoon, that camaraderie, that’s something that labor gives back, especially in the building trades,” Attig told the group of honorees when they were at NABTU’s 2017 Legislative conference. The AFL-CIO Investment Trust Corporation would also like to send a special thanks to Arnold & Kadjan, the International Brotherhood of Boilermakers, Union Lifestyle Benefits, NAI Michael, Buch Construction, the Bank of Labor, Kelly Press, the Segal Company, Steptoe & Johnson, IBEW Local 701, and the many other organizations and individuals who made significant contributions to Helmets to Hardhats through the event. For those who still wish to make a contribution, please contact the AFL-CIO Investment Trust Corporation. All contributions are tax deductible as provided by law. “Helmets to Hardhats” is administered by the Center for Military Recruitment, Assessment and Veterans Employment (CMRAVE) and is a 501 (c)(3) nonprofit organization. Checks should be made payable to CMRAVE.